What is the most popular platform series of all time? Super Mario. Now, what is the most popular puzzle game of recent years? Portal. What happens if you mix these concepts together? If you said “Trine” you’re close, but what I’m here to talk about today is Mari0, a new game from the Stab Yourself team. Now you might be thinking to yourself that Super Mario and Portal are already games, games with developers who jealously guard their intellectual property, so how are the people over at Stab Yourself going to get away with making a game which blatantly combines elements and characters of the two? The answer appears to be the developers are giving away the game for free and hoping the lawyers don’t come knocking, a brave and generous move, in my opinion. Game play should be familiar to anyone who picked up a game controller during the 80s and 90s. We’re a tiny Italian plumber running across the screen from left to right, dodging enemies and jumping over gapping holes in the ground. Mari0 does an excellent job of faithfully recreating the eight worlds of the original Super Mario game from 1985 with its simple graphics, wandering turtles and castles. In fact, if it wasn’t for the fact our little plumber is carrying a portal gun one might think we’d simply downloaded an old NES emulator. But that’s where the fun begins. For those of you who haven’t played Portal, the game’s key element is the portal gun, a device which creates two holes in the environment similar to the “portable holes” from old cartoons. Things go in the first hole and come out the second hole, regardless of where the two holes are placed. It’s a bit like making an invisible tunnel in the fabric of the game universe. This means while Mario is running around, collecting coins and jumping on the heads of his enemies he can “warp” himself from one part of the level to another using these portable holes. Enemies will walk into one hole and out the other. 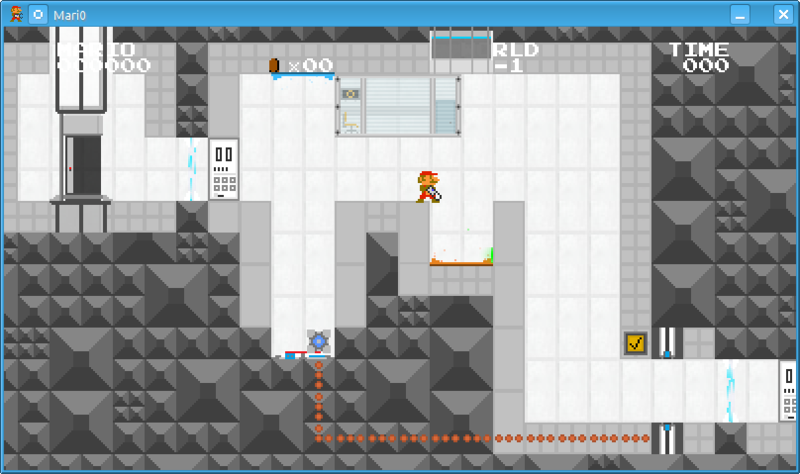 Proper placement of portals can send foes falling down pits or warp Mario to a safer place. When we’re done having fun with the original Super Mario maps we can shift gears and play around with new levels created specifically for the Mari0 game. In these levels we once again control Mario as he moves about the two-dimensional environment, but the levels are filled with elements and objects from the game Portal. Buttons which open and close doors are present, as are companion cubes, deadly lasers and light platforms. Each level contains a puzzle or two to get through and many contain tricks or traps to prevent us from continuing. Being a fan of both Portal and Super Mario I was thrilled with this game and I love that it has both the classic Super Mario levels and original content to keep things fresh. It’s not just a re-make or a clone, there is new material to be had here. That being said, I did have a few issues with this game. The first, and most irksome, was probably the lack of a decent save/re-load feature. We are able to save a game and re-load it, once. However, if we die at some point we have to go back and start from the beginning. There doesn’t appear to be any way to skip ahead to the last level, or even the last world, where we were before. This makes getting through particularly tricky levels a pain as failing to do so will send us right back to the beginning of the game. Riding on the coattails of that issue is the fact that a few — not many, but a few – elements in the Super Mario levels don’t behave quite the same as they do in the original game. This is understandable, making a perfect clone from fresh code would be painfully difficult and time consuming. However, there are times when a player will find certain moves which got them through the original game won’t necessarily work in Mari0, especially where cannon fire is concerned. 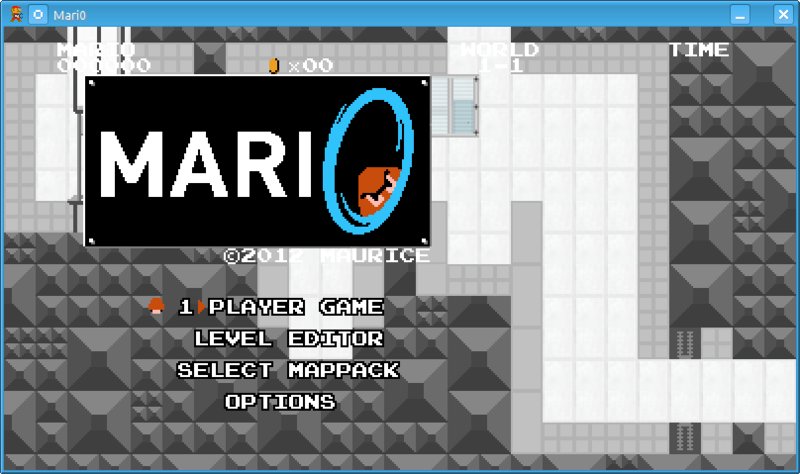 One last item of concern, Mari0 requires the Love framework to run, specifically version 0.8.0 or newer. However, the latest stable release of Love is 0.7.2. This will make it harder for many users to get copies of the game, unless they’re either willing to compile Love from its source code, run a cutting edge Linux distribution or enable (https://launchpad.net/~bartbes/+archive/love-unstable) the Ubuntu PPA. Those issues aside, Mari0 is a lot of fun and, according to the game’s website and one of the demo videos, it is possible to play Mari0 with multiple people at once. I haven’t had the chance to try this yet, but I hope to in the near future. I suspect it will require people to be very in sync with each other and may strain a few friendships. Mari0 is definitely worth the time to download and try, both for classic gamers and people looking for a new challenge.